A brand new tale in the world of Monkey Island is coming out, and I'm hoping for a fun old style adventure game in the vein of the classic genre. I went ahead and pre-purchased all five episodes, and can't wait to delve in. But, before starting to play episode one, I decided to refresh my memory on that which came before. This is a review of my experiences with The Curse of Monkey Island. Unlike Monkey Island 1 or 2, I have Monkey Island 3 on a CD. The game is supported on Windows 95 and I was hoping I could get it to work 'as is' without resorting to SCUMMVM or some other utility. It went through the install easy enough, but unfortunately I got stuck there. The game loaded, but immediately had a sound issue in the opening screens. I gave up and reverted to the ScummVM path. This time I discovered the SCUMMVM wiki. It tells me the data files that are needed to run the game. I was able to grab those data files direct from the CD without needing to install the game. That is good info to have and made the setup process a bit easier. With SCUMMVM, I had no issues. Elaine Marley, will you marry me? The Curse of Monkey Island is a big change from the previous two games. First, the games visuals are done in a cartoony style. I have to say I quite like it. Second they added voices, something that would not have been practical back in the floppy disk days. It is also worth nothing that Ron Gilbert was not on board as the designer for this third entry. Despite these changes, the game goes out of its way to pay homage to the Monkey Island theology. The game starts out shortly after the strange Monkey Island 2 ending. Guybrush Threepwood, our pirate hero, is floating through the sea on a bumper car. He is pining for his lost Elaine and fears for his death from hunger and thirst. He obliviously floats between a sea battle between Zombie Pirate LeChuck and Elaine Marley on Plunder Island. Elaine declares her true love for Guybrush, LeChuck is defeated, and Guybrush pops the question. Placing LeChuck's cursed diamond ring on Elaine's finger. She promptly turns into solid gold. The voices are hit or miss. Guybrush sounds great and I couldn't have picked a better choice myself. LeChuck's is good enough. Elaine's voice is not what I would have imagined, though. Other characters from the past are back such as Wally the mapmaker, and Stan the salesman. Murray the Talking Demonic Skull is introduced in this game, and I must say he is my favorite character from the 'later' Monkey Island games. Defeating the curse and turning Elaine back into a human makes up the bulk of the games plot. 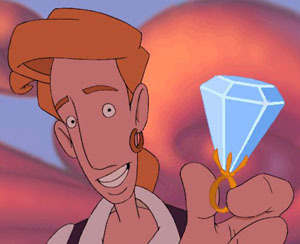 Guybrush must get a bigger, better, uncursed diamond ring to offset the cursed ring. The ring should be found on Blood Island, and to get there Guybrush needs a ship, a crew, and a map. That is standard fair for these games. The interface of this game is different than the previous two. You click on an item and a "do stuff" window pops up. You can either use the mouth, to talk to or eat something; the hand, to use something; or the eyes to examine something. The interface is simplier than te point and click verb noun of the previous game. But, you'll get used it to quickly. Unfortunately things do downhill after that. The games puzzles were tedious and there are so many items that the game is often one big click fest, trying to figure out what you combine with what. There are so many "useless" hotspots it is almost impossible to figure out what should be clicked where. I'm not sure if it is better for a game to have lots of hotspots for the sake of exploration and fun, or only hotspots that move the game forward. I suppose a balance could be reached, but this game does not reach it. The endless clicking was just frustrating and detracted from enjoyment of the game. It was as if behind every locked door was another locked door, and any progress was slow. As with the previous entry in the series, this game offers an easy path and a mega monkey mode. I played through both. The easy path bypasses a few of the more obscure puzzles, which actually makes the game a lot more enjoyable to play. Monkey Island 2 had the weirdest ending of all video games. 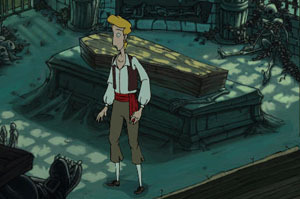 Unfortunately, Monkey Island 3 tries to make sense of that ending with little success. I have no idea what Ron Gilbert originally intended, but I'm sure this was not it. The design of this game was probably constrained by what came before. Next up, I'm going to try to install and play Escape from Monkey Island, the fourth in the series. This game is not supported by SCUMMVM, so I'm not sure what to expect in terms of installation woes. After that, I tackle the new Tales of Monkey Island.